The Spusta Gnomes have scrapped together about another 100 Mystery Trio Mini Print Packs to be made available to you fine folks. This Wednesday, at a few random times in during the day, the gnomes will add some inventory to the shop. Along with the shop sale, we also want to make these available in an easier way than catching them during the brief moment before they sell out. 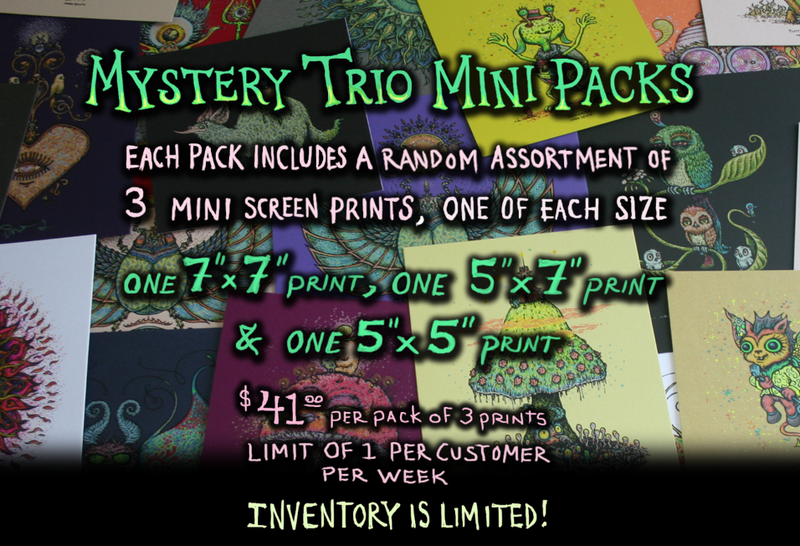 So, if you’re interested in getting a Mystery Trio Mini Pack, just post a comment here, and we will be picking customers and sending them invoices for a pack before Wednesday’s sale. There will be a randomness to the customer selection process, but it will also favor new customers who may have not gotten any mini prints from the Shop yet. About half of the inventory will be sold through the random customer selection lottery here, and the other half will be sold through the shop on Wednesday. Wellllll! hell Yeah I would LOVE A MYSTERY PACK! seeing that I never score them in the store! Yippe kye aye! Love u Marq n Gnomes! Would love to be picked Gnomes! I would love a pack! Thank you so much for the chance outside of a drop! would love a mystery mini pack! Thanks for all you do! I would love a mini pack! Missed the last few rounds due to drop time and our time zone :). Thx! Would def love a mini pack! Need my mini fix 🙂 thanks Marq!!! Oh hell yeah its mini time! Morgan and I would love a pack! Thanks to Marq and the gnomes. U guys rock! Have none of the new minis! Would love in on this! I would love a mini pack! Please put my name into the drawing. Thanks for thinking of new ways to keep everything fun and fair and for everything! Mystery pack would rock! Thanks Marq this was a great idea, I’ve missed out on the last serval drops because of work. I appreciate the opportunity Bro. Keep missing the drops lately due to school. Would ❤️❤️❤️ a chance at a mystery mini pac! Thanks Marq and the gnomes! Love a good mystery pack! was just thinking I need a fresh mini pack, yes please! Would love a mystery pack this round! Thanks Marq! Cordially requesting your consideration for myself as a mini pack recipient! I would like a chance to be picked ! Thanks!! I’d love the chance for a Mystery pack! Thanks for the chance. Peace and love..
Yep, I’m going there… Today is my birthday and access to a mystery pack would be the perfect gift! Haven’t had a Spusta mail day in far too long! Thanks to Marq and the Gnomes! OoOo..what a twist! Fingers crossed! I love a good mystery! Many Thanks! Yes please! Always love a mystery pack! Oh yea hit me with an invoice! I would love some minis!!! I’m a newbie and my obsession is full throttle! Feed my addiction little gnomies! Count me in! Thanks again Marq n the Gnomes! Put me down for a mini pack. Thank you. Thank you would love a chance! Long live the mystery mini packs. I’d love to grab one and will have my best F5 going! Thanks. Thanks Marq and Gnomes! I would love a mystery pack! Would love to get a mystery mini pack! Would love a chance at this gnomes!!! I would love the opportunity for a mini. I’d love a mini pack. Thanks! Cheers to my gnomes so near! Mystery for life! Yes please! I would love to buy a Mystery pack. I’d love a mini pack, thanks for the opportunity! I love your art and would love a mini pack. Thanks for the chance. I would love to see one of those mini packs come my way, for sure! Thank you Marq and Gnomes. I’m interested! Can’t wait to see the packs! Pick me, I’m clean . . . Pick me I’m clean . . .
Night owl says who… Me?! Would love some new minis. Yes please to ART ! New to mini packs! One please! I’m kind of new. Pick me, Pick me. Thanks for the great and fun art! This would be my first mini. I have a few panic posters and the RR Dead poster but I would love some minis to decorate our nursery for our child we are starting to try to have. Sure would appreciate it! Thanks for changing this up a bit to give more people that really want to keep them a chance. I hope to hear back from you!!! you know i love a good mystery! I’m an old collector from the late 2000’s. I keep and trade Marq’s stuff. I don’t land many sales as I work on Wednesdays. Excellent opportunity. Enjoying all the fun artwork! Who doesn’t need more mystery in there lives? Put me down for a pack! Woo! Hoo! I would be absolutely thrilled if allowed to purchase a mini pack! No luck in the last few drops & I’m needing some Spusta love in my life! Thanks for all you do & creating art that makes me smile! Thank you Gnomes & Mr Spusta for the Halloween treats & tricks ! I’d love a mini pack. Minis, I can’t get enough of ’em! I would love to get myself a mini mystery pack. I’ve been dying to get a mini collection started. Some day I’m gonna have enough Fazooli’s for a nice multiple frame up. Thank you so much for offering the newbies 1st shot. Love me sum Spusta!!! I would love a mini pack. a mystery pack for The pooles would be greatly appreciated!!! Yay, I’d love a mystery pack! Mystery packs are always a delight to get! Your art work is amazing marq! Would love a mini pack this week. Thanks always for sharing your art with us. Would love a pack! Thanks for the amazing art. I’m in for the mini pack lotto!! I would love to get a mini pack. Haven’t gotten one yet. Would love a shot at some mini prints – thank you! Oh how I would love a mystery pack on the 15th of October!! This special day happens to be the day my twin daughters turn 2!! We will be on a family outing in Baltimore watching a dolphin show so I won’t be able to take the time away from my birthday girls!! Hoping to get a mini pack! Cheers to the mini pack! Love your work and would love some minis.. Thanks for the chance! In! Thanks for the chance gnomes! Would love a mystery pack!! Thank you to Marq and the Gnomes for all your hard work. This noob NEEDS her first mini pack! Thanks! Would love a random pack! Thanks for this rad opportunity!!! I love your posters! Would love to get my first mini pack. Wow would love to get one of these before they drop, fingers crossed. Always down with some mystery mini madness! Going for my first pack! Thank you Marq and gnomes! I haven’t hit a mini drop since June or July… hoping my luck turns… feels like a long time in the woods! Would really love a mystery pack! See you in San Fran on the 25th! I’ve gotten tons of minis from the shop so I shouldn’t be picked, but I can’t resist entering anyway.. I would love to get a mystery pack. Keep up your fine work Marq. would love a Mini Mystery Pack 🙂 Thanks Marq! I would LOVEEEEE a mini pack please and thank you Marq!! Much appreciated!! Would love a mini pack! Have never scored at the random release! I’d love a mystery pack! Please pick me! I would love to get a pack of minis! I seriously love these awesome little characters! I’m hoping to catch ’em all eventually but I haven’t been too lucky on the last couple releases. I would definitely appreciate a Mystery Pack. In the time it would take to fill out my CC info my order would not be saved and the packs would sell out. Only after I registered for Paypal this year did I even have a chance and still no Smeezy, my favorite mini character. In Q3 financial meetings all day tomorrow, would love a pack. Payment ready! Would love a pack of minis! I am totally addicted to minis!!!! Please send a pack my way 🙂 Thanks for all the killer art!! +1 mystery mini pac please. Thanks for all the fun! Best of luck everyone! Hope I am not too late! Would love a stress free pack. Awesome, I’d love a chance at picking up a pack! SPUSTA rocks – thanks for that chance to take part in this lottery. Would love to get a pack! I would love a mini pack! Saw a bunch of good stuff @ Furthur Framing in Denver, but couldn’t get my hands on any. Ahhh, I’d love a chance to get some awesome mystery prints–thanks for the opportunity! Love your work Marq and thanks for the chance! I’d love a Mini Pack!!! I would love a Mini Mystery Pack! yes please Marq!!! I would love one!!! Oh noooo!!!! Am I too late gnomes??? Oooh. Exciting! A chance at something hand embellished – count me in. OG Spusta fan right here from WAY BACK. I’m hitting the road tomorrow for a week long pearl jam run in the mid west and will be offline all day. Hook an OLD SCHOOL brother up Gnomes. A mystery mini pack would do me right, gnomes!!! It’s been a very long time since I’ve been able to purchase from the site, due to the increase in love that you’ve been getting Marq! I’m happy for you, but I’d love to be able to grab one of these! Wouldn’t mind a pack Marq! Please oh Please give me a chance. would love a chance at a Mini-Pack! Wow what a wonderful idea and I would love to win a pack!! Just getting started collecting and this would make my week! Thank you for the chance!! Good luck everyone! Omg awsome, I hope I can score one! I would love one!!! Looks like I misses the invoice, gonna have to try my luck on the drop, good luck everyone!! Please and thanks for the chance! I have a mini print that I love….it needs some company! I’d love to have a trio to hang on the wall of my daughters nursery when she arrives in February! Thanks! Would love to score my first mini pack today!! Would love a mystery pack!!! Would love one of these PLEASE!!!! just scored my first mystery pack. so pumped! i havent gotten any minis in a long time, would love to add some to the collection. any clue on the next drop? dang! twice shutdown w/ paypal. please gnomes have mercy on me! OK. Who is hanging out here?….let’s drop a few more at 1:38pm pst. Oops, a few more up now. We were a few minutes late as a delivery just showed up at the studio. is it too late to possibly get one of these? Just found out about it, and really enjoy these. For those keeping track at home and checking the shop, we are done releasing any inventory today. Much more to come in the future – an new batch of minis is on the horizon. thanks so much to the mysterious marq and his magical gnomes, third try’s a charm. cheers! Yeehaw! Hoping for a “in this together”! Maybe too late but I’d love a mini pack! Random comment! Hope it = random pick! I would love one Marq!!! THANK YOU for the birthday mystery pack! I’m completely amazed… All firsts for me. I am constantly amazed by your work, Marq. I truly appreciate you and the Gnomes! Much love! What a nice surprise! Some of the best artwork I’ve been able to afford and enjoy in a long time. Thanks for today’s gift. Wow what a Great Idea. I am New to this, i went Far and wide to fond the Lockn poster. i am so intrigued by the work. as an artist myself i love Detail. I really want to start a Collection to pass down to my son. Thank you VERY much!! I would very much appreciate a pack. Thank you for your great body of work! I would love one of these as I never score them in the shop. Please hook it up! Thanks! Brilliant! And I just love your artwork! Would be eternily greatful!! Would really like to add some of your art to my collection. Very nice work. Love your art work, would love to come home to a mystery pack of art!! Just getting Started so Any chance to get some would be eternally grateful. Just came across your stuff and I’m instantly a fan. My daughters are both art majors and I can’t wait to share your work with them. Hope to own a piece in the future, keep up the good work. If not to late, I’d love a mystery pack. New to the site, but not to the artwork!!!! Love it!!!!! Slightly more than my 6&1/2 year old son. Thanks!!!!! I haven’t bought any Prints from the shop since I was able to continually check back and purchase Mini-Packs whenever I felt like something new, or wanted to give a Print as a gift. Times sure have changed since then ! Congrats Marq on the new success, but sure did like the old days better. Would love a chance at some new stuff !!! Count me in on the lotto. Thanks! I am finally back on my feet and am so excited to get my collection going. I get so inspired. Finger’s crossed one day it will blossom. I’d love a mystery pack! I have a few prints but I don’t have any mini’s.